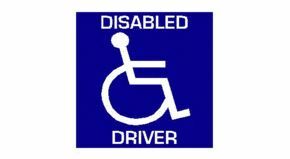 Disabled Driver - Interior Car Window Sticker. My local mobility shop has stopped stocking these, so pleased to find an alternative supplier. They are fine. Bought one of these for back of car, not that I expect other drivers to notice it. Helpful for when getting wheelchair out of boot, as bit more room is required than normal. Excellent product. These are a good size and go on the inside of the window. I have put one where the tax disc used to go and one on the back window. Well pleased. Good price. Speedy delivery. the sticker was just what I wanted. Service & Delivery spot on.